Stevens Plains was situated in southern Maine in what once included Falmouth, Westbrook, Deering, Cape Elizabeth, Portland, South Portland and many of the Casco Bay Islands. Over the years there were many boundry distributions and now what was known as Stevens Plains is the flat land situated on what is now Stevens Avenue, running between what is known locally as Morrill's Corner and Woodford Street. Stevens Plains is named after Zachariah Brackett Stevens whose family (Brackett) first settled there in 1740. He started the tin industry there on what used to be part of the family farm in 1800 or so. As his business flourished it attracted other craftsmen to the area and Stevens Plains became a thriving community with other tradesmen moving there from other parts of the country to set up shop. The painted tinware from Stevens Plains is much admired by collectors. It has its own unique "look" and artistic design. This particular piece is in very fine condition with its fine original surface and paint. While there is the expected craquelure to the paint, surprisingly it is mostly there with very little loss. The painted decoration is bright and bold and the colors are strong. Rarely do we find early 19th Century painted Tinware in this condition. 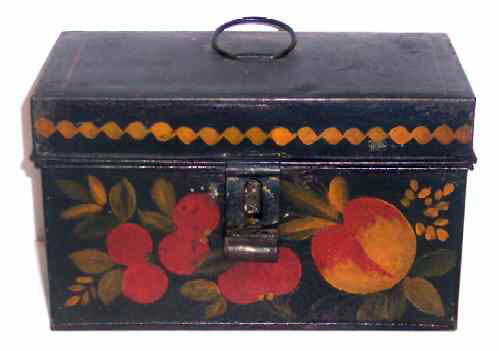 The style of this trunk, with the flat-top rather than the domed top is unique to the Stevens shop. Cherries, both single and double forms are common motifs on Stevens shop pieces. Blended leaves surround the cherries and the peach and compact yellow rickrack strokes are used to frame the lid. Floral sprays made up of a variety of flowers are the usual designs for this shop but a few pieces have been located, however that exhibit only fruit motifs . . . in this case three sets of double cherries and a peach. Very desirable size: 6-1/2" long x 3-1/4" wide x 3-3/4" high.